The Accidental Machine, which was nominated for the Nebula Award in 2007 (it lost, unlike Haldeman’s Forever War and Forever Peace novels) is a tricky book review. It is very close to being a very good mix of humor and hard science fiction. It’s close to being trash that was barely worth reading. All in all, the writing quality is very uneven, and the good parts (barely) make it worthwhile to finish. 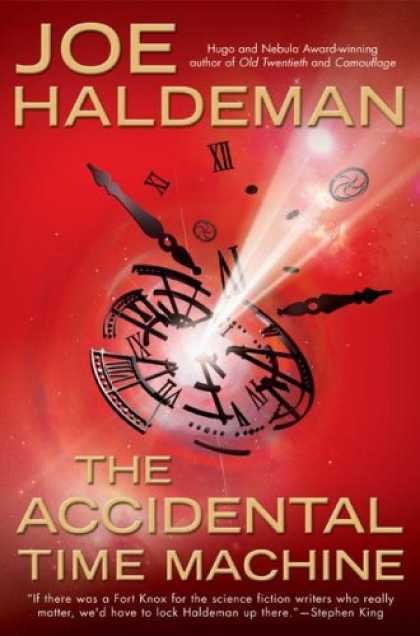 The protagonist of The Accidental Time Machine is Matthew Fuller, a laboratory technician at MIT, who accidentally ‘breaks’ a complex piece of lab equipment and turns it into a time machine. The time machine goes only one direction — into the future — with jumps of exponentially longer duration. So jump-time goes from about 1 second, to about 12 seconds, to about 144 seconds, to nearly six hours, and so on. As Matthew goes farther and farther into the future, life is always an exagerated version of what we’re familiar with (religious conservatism, or materialism, or bureaucratism, etc.). Unfortunately, Haldeman sabotages his own work with pointless (in the truest sense: with no intellectual cut or heft) attacks on religion. I’ve read works by atheists who care deeply about their viewpoints, and argue them coherently and logically. Haldeman can’t be bothered. Instead, Haldeman could have cut the exposition sharply, included some reddit threads in an appendix, and everyone would have been happier. I read The Accidental Time Machine in the Nook edition. It is also available for Kindle.